Improve plant reliability, emissions control, and performance of generating assets. We protect your investment by helping you minimize the consumption of energy, prolong asset operating life, and minimize the cost of ownership. Leveraging our state-of-the-art solutions, you will improve your plant’s emissions control, reliability, AGC capability, steam conditioning, water chemistry, and generation assets operational coordination and overall plant automation. Choosing ControlSoft gets you a team of dedicated project and support engineers with extensive experience in the power generation industry. We offer a full range of project services to optimize plant and fleet performance. Our team of power industry experts will work with you to improve plant availability and flexibility while enhancing workforce productivity. We are ready to help you optimize your process control to maintain peak performance under any market conditions. See how we’ve helped power plants reduce fuel costs and emissions, increase revenues with better plant load flexibility and improve ramp rates. Improve your plant profitability and reliability through control system health and performance. Reliably realize and improve available generation flexibility. Reduce operating and maintenance costs by improving process control. Improve unit heat rate (plant efficiency). Institutionalize plant control knowledgebase. Standardize tuning practices. 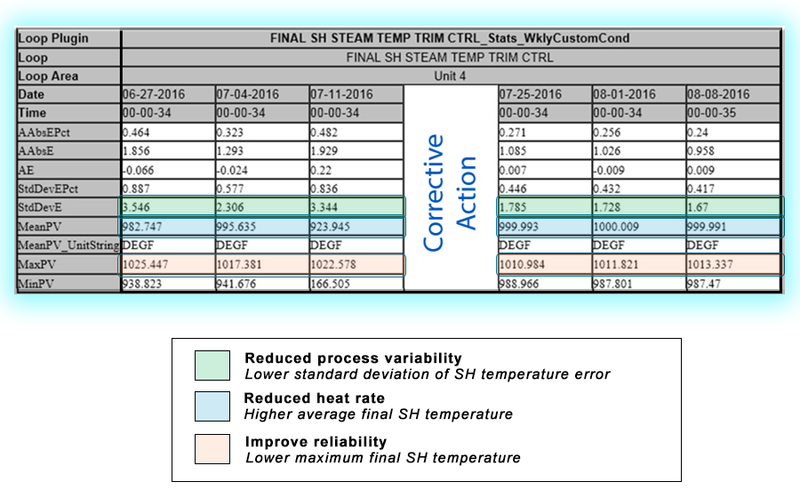 Actual performance data of final SH steam temperature control before and after corrective actions. I&C engineers and technicians can use INTUNE+ I&C INSIGHT to view diagnostic messages, performance indices and process trends, and take corrective action. Remote access to real-time control valves and diagnostic events of process controllers. Diagnostics message center with filtering and archiving capability. View of DCS control hierarchy of all PID controllers reflecting cascading relationships of controllers color-coded for performances. Average error, absolute error, standard deviation of error, percent of time in various modes of operation, percent of time in various alarming states, oscillation frequency, valve stiction percent, tune status index, recognized patterns in relevant process trends for control loops and final elements. Date and time indexing of diagnostics message. Configurable time horizon for data analysis. Configurable set of commonly used or user-defined KPIs for controllers and final elements. List of available and preconfigured process trends. Process fault root-cause analysis by information drill-down using hyperlinks from diagnostic messages to relevant process performance indices and to relevant process trends focused in relevant time frames. To meet the demand of greater production flexibility, we invested in ControlSoft’s MANTRA Duct Burner Optimization technology. This technology has proven very effective for our plant in meeting the CAISO’s dispatch regulation for AGC and ADS signals through our entire MW operating range, including the firing of our duct burners. Our plant’s operators are very impressed with MANTRA software’s capability to respond to load changes. Our plant can now demonstrate a greater range of operating flexibility over its various plant configurations, and more consistent heat rates while maintaining a constant unit ramp rate at MW transitions when the duct burners are fired. It did not take long for our operators and engineering staff to appreciate the functionality and ease of use of ControlSoft’s technology. We received superb service during this install and found the management, sales, and engineering teams at ControlSoft to be very responsive to our business and technical needs. As a result, I have no reservation in recommending ControlSoft as a service and solution provider for the power generation industry.